In this post, I’m going to show you how to change permalink in your WordPress website without losing traffic or search engine rank. Permalink means Permanent Static hyperlink and this what the user type in the address bar. It is always unique and direct readers and search engine to your webpage or blog posts. It is recommended to choose the perfect Permalink settings depending upon the type of website at the very first stage instead of changing it in the middle. What happens if you change the permalink of your blog? Your permalink structure plays a vital role in the search engine ranks. All search engines crawl the content of your post and store it in the database by considering Permalink structure as one important parameter. If you are going to change Permalink structure without telling to search engines then definitely you are going to lose your traffic and user who bookmarked your favorite posts are presented with 404 Page errors. To overcome these two main problems you need to redirect your old permalink to new permalink. Before proceeding into that let’s see how to select the best permalink structure for your website. It creates a unique ID say ?p=133 for each post. This 133 refer the serial number of the post. The search engine can also able to index this number but this is not recommended because it is not to search engine friendly and doesn’t contain any focus keywords in the URL structure. This type of permalink is recommended for a news blog. It does contain the blog post name in the URL which helps search engine to index easily. Post name is added at the end so if your title is long then all the keywords in the title may not be read by the search engine. It is similar to default or plain permalink but along with that, it contains the archives text in the URL. It is also not a recommended one because it’s not searching engine friendly. This is the most recommended type of Permalink settings and it is preferred by most of the bloggers. It contains the title as well as focus keywords of your post so it is readers friendly and search engine can also easily index them. When you are posting an evergreen content then you can prefer this type because the search engine won’t reduce the page rank by publishing date. I hope now you are clear with different types of Permalink and its purpose. Now let see how to redirect the old URL to this new URL. To do that, you need to make a change in the .htaccess file. It is located in the root directory of WordPress and you can access it either by using Cpanel or with the help of YoastSEO plugin(Most recommended plugin(free) for SEO blogs). There are many direct plugins available for this redirection but making the change in .htaccess is more preferable than that because if you install a separate plugin then you need to keep it permanently to make redirection continue to work. Just assume that you’ve changed permalink structure from Month and Name (http://www.YourDomain.com/2016/05/sample-post/) to Post Name (http://www.YourDomain.com/sample-post/) by navigating to Dashboard > Settings > Permalinks. Go to google and type keywords to display any one of your posts. In the search results page, you can see the old hyperlink and if you click this link you’ll end up with 404 error because search engines take some time to index those updates. To avoid this you should redirect those to new permalink structure so that you won’t lose the PageRank, as well as you, are conveying to search engines that permalink structure has changed. How to redirect to new permalink? 1)Go to Permalink helper and enter the URL of your site (start with http:// or https://)) in the first text box. 2)If your blog running in the subfolder of the domain then you should enter the subfolder name in the second text box. 3)Select your old permalink structure in the radio button. If it is custom provide the custom format in the last text box. 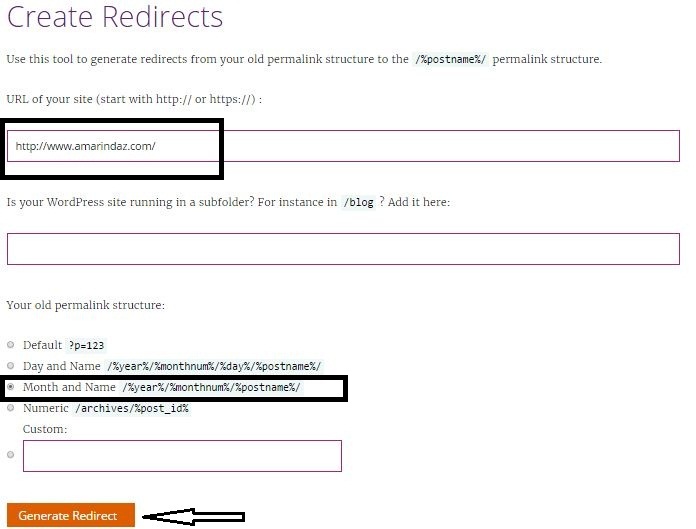 Click generate Redirect button to get your redirects. 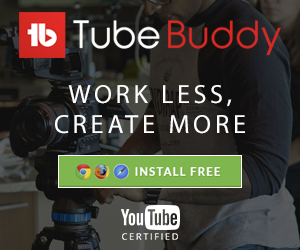 Copy the redirect for your blog. Now go back to your blog Admin Dashboard > Yoast SEO >Tools >File Editor. It shows the content of your .htaccess file. Prior to editing this makes a copy and save it in your local drive. 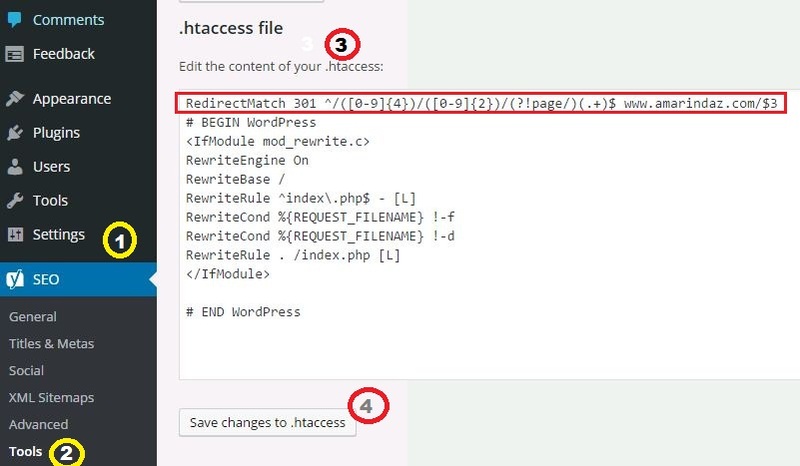 Add the redirect code at the top of the .htaccess file (before #Begin WordPress) and save the changes. That’s it redirection is set for your blog. Now you can check the redirection by repeating your posts search in google. Let me know if you have any doubts If you want to use our service to redirect your blog please contact us via the contact form. Thanks I Have Just Changed My Old Permalink To New One. Do I need to redirect each post separately to a new link using 301 redirect after following instructions given above? Or above instructions suffice. Actually I’m going to change permalink structure of my blog posts and therefore I don’t want to let any stone unturned.